Blog › Mail destroyed in Smithills...Postbox Arson Attack!! It was only last month when residents of Lancashire fell victim to the latest local arson attack. Residents noticed their local Royal Mail postbox had smoke coming from it one afternoon, on the junction of Smithills Dean Road and Abercorn Road. It has been reported that many had spotted a group loitering around the area, just before the incident took place. The Bolton North firefighters put the blaze out, however the letters which were in the postbox had either been damaged by the fire, or by the water which had been used to put the fire out. 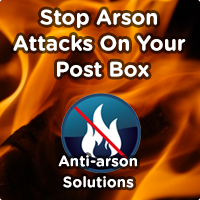 Protect your home mail and property today and purchase an anti arson letterbox. If you'd like more information about our range, or our opinion on the best option for your property, please contact us today.